The idea of music as a healing modality dates back to the beginnings of history. Mythology is full of stories suggesting that music is balm for the soul. The Bible talks of how David played the harp to help ease his despair against King Saul’s tyrannies. In Greek mythology, there is the story of Orpheus—the musician who could soothe savage beasts and move rocks with his lyre. Music therapists in India derive a lot of their knowledge from the science of yoga. Physicians of the ancient Muslim world treated mental illness with music therapy. Special choirs and live music bands entertained patients and there were comic performers as well. Some of the earliest notable mentions are found in the writings of ancient Greek philosophers. Robert Burton wrote in his 17th century classic, The Anatomy of Melancholy, that music and dance were critical in treating mental illness, especially melancholia. Contemporary research seems to suggest that music therapy benefits patients with stress, psychological and psychiatric problems because it brings about a sense of well-being. Researchers at the University of Sydney found that singing in groups for at least 30 minutes a day helped people cope better with low moods caused by chronic pain. Another study by researchers at Cleveland Clinic in the US found that music helps ease unrelenting, non-malignant pain in adults who “hurt" for at least six months. Music has also been found effective in managing pain caused by cancerous conditions in the body and procedural pain. Studies have also shown that music reduces pain during dental procedures. Playing soft music in the background while working at one’s desk has also been found to reduce stress. Reduced heart rates and higher body temperatures are said to indicate the onset of relaxation. T.V. Sairam, a New Delhi-based music therapist, says that music could help him cope better with life’s stresses. “Right from childhood, I was interested in music. I then discovered that listening to music or singing could help me overcome difficult situations in life," he says. Based on these experiences, he became interested in studying the therapeutic aspects of music in a more serious way. Having benefited from music therapy, Sairam has become an active proponent. A Mumbai-based psychiatrist, Rajan Bhonsle, claims music has helped to cure many stress-related illnesses in his patients, including one who had a bad case of psoriasis, a skin condition. The patient had consulted several specialists but nothing had worked. “I told him that he should listen to his favourite music every day. Sure enough, over a period of time, the psoriasis was cured," he claims. A sexual-health expert, Dr Bhonsle says: “Music relaxes the mind and the body so it works very well in conditions that are anxiety related, such as performance anxiety." He believes that music can even help counter other marital problems that may have their genesis in work-related stress. “Just helping the body produce some of the feel-good hormones, such as serotonin, can alleviate many stress-related illnesses, and can also go a long way in improving a person’s relationship with his family," he says. Snehalata Deshmukh, a paediatric surgeon and former vice-chancellor of the University of Mumbai, says she has done several studies on the subject. In one study, she compared two groups of premature infants, both of which were given all the necessary care in terms of nutrition and medication. Music was played to infants in one group, but not to the other. “We saw that infants in the group that heard music every day gained weight faster than the ones that did not," she says. The same study was then extended to pregnant women, and the results were positive. “In ultra-sounds, we have seen that babies make a happy face when they listen to certain kinds of music, especially in the last trimester of pregnancy," she says. According to Dr Deshmukh, babies even seem to have preferences in their choice of music. “We have observed that most of them like Beethoven’s symphonies, or Omkar, or raga Yaman, or Shivkumar’s santoor, because some of these rhythms are similar to the mother’s heartbeat," she says. When Jamuna Balamurugan’s sister recommended music therapy to help her cope with stress during her first pregnancy, she was a bit sceptical. “I wasn’t exactly sure how it would help, but I was also beginning to worry about how work pressures would affect my baby," says this Chennai-based homemaker. 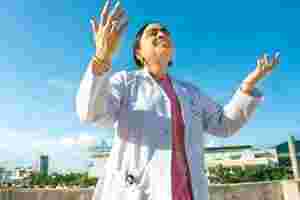 Signing up for a music therapy programme conducted by T. Mythily at Chennai’s Apollo hospital, she was initially “prescribed" some instrumental music which, she says, made her relax almost immediately. The bigger benefits, however, were evident in her baby. Balamurugan claims her daughter is much ahead of her age in analytical and communication skills, and even in creative thinking. Dr Mythily, head of the music therapy department at Apollo Hospital in Chennai and Balamurugan’s therapist, says: “Music is being tried in many areas, sometimes as a supportive element to conventional therapy and at other times, as an alternative therapy in itself." According to Dr Mythily, music therapy is of two types. One is passive, which involves only listening, and the other one is active, which involves participation. “The passive form is beneficial in enhancing concentration and memory, reducing stress, heart problems and hypertension," she says. “The active form is of immense help in treating neurological problems, such as neurological aphasia, receptive aphasia, expressive aphasia—speech problems—and it enhances speech fluency, especially in hyperactive children," she adds. For some time now, Balamurugan has been recommending music therapy to scores of expectant mothers. In fact, about two years ago, when she was expecting her second baby, she signed up for the programme again. And as she sees her baby thrive, she is once again happy to give the credit to music therapy. There are more than 5,000 music therapists registered with the American Music Therapy Association and more than 300 registered music therapists in the UK. In India, there appear to be a handful , who are self-trained. Much of the work in this area is driven either by doctors who have a penchant for music or by musicians. Across India, efforts to include music therapy in mainstream medicine have been very limited and sporadic. Notable exceptions are a few health care institutions such as Apollo Hospitals, Northern Railway Central Hospital in New Delhi and Hamidia Hospital in Bhopal, Madhya Pradesh. In recent years, a few centres of training for music therapists have been set up. Apollo Hospital in Chennai is training psychology postgraduates and doctors in music therapy. The Indian Music Therapy Research and Development Foundation and the Swathi Thirunal Music Therapy Research Centre, both in Kerala, offer short-term courses in music therapy. 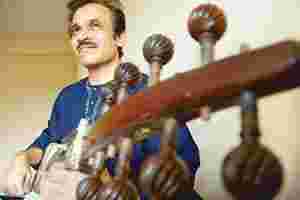 Vivek Joshi, a sarod player who has been performing at various hospitals, vouches for the calming effect of music. Because the concert was beneficial to so many, the hospital started playing piped music in all its wards a few months ago. This was to determine if music would help accelerate the rehabilitation process of patients with mental illnesses, says Sanjay Kumawat, member secretary, State Mental Health Authority, government of Maharashtra. “We have a variety of patients with different mental illnesses—so we were keen to assess the impact of using music as therapy. We found that patients respond well. It helps to soothe their minds," claims Dr Kumawat. The hospital authorities are so enthused by the success of their programme that they are planning some more sessions of live classical music for patients. In addition, they are proposing similar programmes at other government-run mental institutions in Pune, Ratnagiri and Nagpur.